From the Bible, we know that God commands us to love Him first, then love our neighbor as ourselves...but what does this really mean, and how do we apply it in our lives? Penned from Gwen's own experience and decades of teaching seekers how to have a relationship with the Father, this book is a beautiful and inspiring writing that starts with a history of God's love for man and mankind's appropriate love back to the Father, then explains how this True Love can overflow into love for those around you (even the unlovable)! 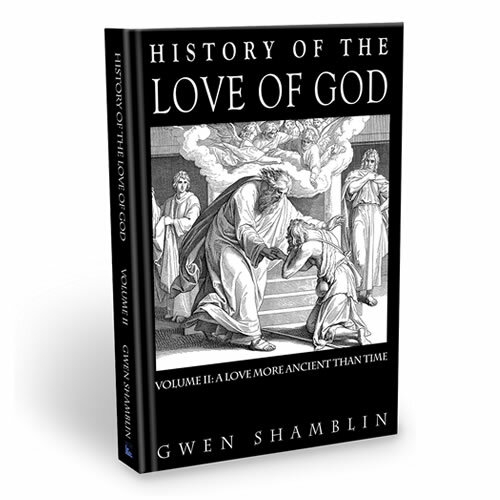 History of the Love of God will move your heart to a deeper true love for God, a greater appreciation for Christ and more compassion for your fellow man! from Indiana Love this book! This book has made the most profound affect on my relationship with God, who is LOVE. This incredible resource has shown me the path to salvation through a consistent loving attitude no matter what is going on and a sweet appreciation for all God’s decisions. God is Love and His Love will rule as Sovereign In my heart because of this book! Many thanks to Gwen for pinning down the most life giving words ever! from Franklin THE BEST Book Ever on God's Love! from Brentwood The Most Inspiring Book Ever!!! Wow!! Wow!! Wow!! I cannot get enough of this book!! This book taught me "HOW" to love God with ALL!! I now know "HOW" to live out the book of Acts! The History of the True Love of God charged me to go deeper in love for God and all mankind! It has changed the dynamics of our family. Every member in my family from the youngest (3) to oldest(42) becomes more loving, forgiving, and selfless with each read. I truly believe if every houshold in the world had this book, read it, and put it into practice, this would be a different world for generations to come and God would be overwhelmed with joy!! The book is beautifully convicting and is read daily in my house! Until I read this book I never knew what true love was. This book described not only God's love for me, but also how to love HIM back. And how to love others. My definition of love before reading this book was wrong. Only through this book can I truly love God and others with a sincere heart.